Nelson's last letter to Emma Hamilton was the final letter he penned before the battle of Trafalgar. It was unfinished and she received it only long after the battle had ended. 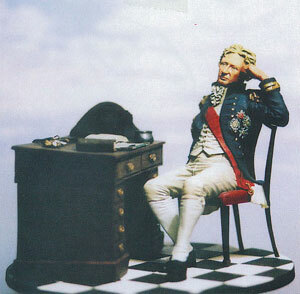 Our model is based on the famous painting by Charles Lucy and shows Nelson in pensive mood, pondering what he would say to Emma. The letter's content is fully documented in histories of the occasion. It was not possible to mould the quill pen in resin and this item is left to the interpretation of the modeller. Currently out of stock - please contact us for details.